Home » Minor and Major Bleeding » WHAT DOES SKIN DO? The skin is the largest organ of the body; it covers the entire external surface of a human body. Skin performs many different roles. These include sensation, protection, temperature regulation, excretion and production of vitamin D.
Skin is an elastic covering. It protects you against exposure to dangerous things in the environment such as bacteria. It also repels water, minimizes water loss from the body and protects underlying structures such as blood vessels, nerves and organs. The material posted on this page is for information purposes only. If you want to learn to recognize and manage major or minor skin injuries enrol in St Mark James first aid and CPR training. • Stores water and fat. • Is a sensory organ. • Prevents entry of bacteria. • Control of insensible fluid loss. • Epidermis – the outer or the first part of the skin. That consist of: Stratum corneum (horny layer) Keratinocytes (squamous cells) (Basal layer). • Subcutaneous fat layer (subcutis) – The subcutis is the deepest or the third layer of skin. The subcutis consists of a network of collagen and fat cells. A laceration is an injury that results in an irregular break in the skin, more commonly referred to as a cut, but defined as a torn and ragged wound. You do not need to see a doctor if the tear does not involve the full thickness of the skin. Most minor lacerations have minimal bleeding, minimal pain and no numbness or tingling at the site. If you can see any bones or tendons or there is excessive bleeding and pain, seek medical attention immediately. • Clean the laceration site well with warm water and an antibacterial soap. • Apply an antibiotic ointment such as Bacitracin or Neosporin. 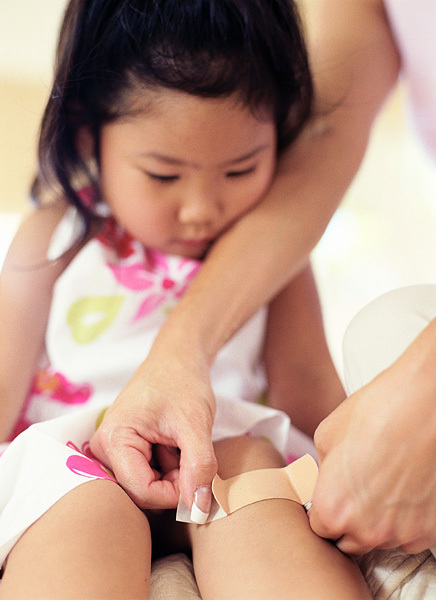 • Cover the laceration with a Band-Aid or sterile gauze. Change the Band-Aid daily or when soiled. When the dressing is changed, clean the site and reapply the ointment. If red streaks or drainage appear around the laceration, please contact your primary care physician immediately. An Effective first aid strategy is the ability to deliver treatment. The goal of the person performing first aid is to do what is necessary. First Aid Training may be a small thing for most people but first aid training (register here) may just save your loved one’s or your own life.